A beautiful presentation of our classics! Our individually-wrapped pieces are the perfect way to enjoy a bite of our classic candies at their freshest every time. 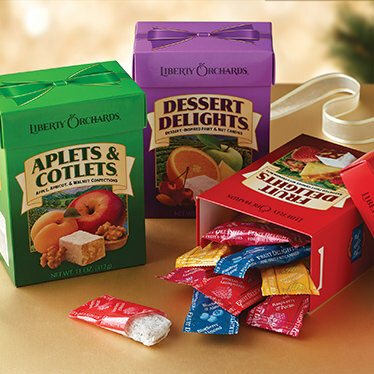 And now we've gathered them up in a lovely trio of assortments that are just perfect for giving! 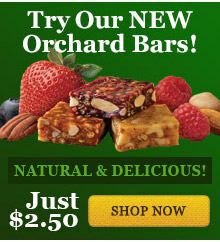 Choose from Aplets & Cotlets (Apple-Walnut, Apricot-Walnut), Fruit Delights (Strawberry-Walnut, Pineapple-Macadamia, Blueberry-Almond, Raspberry-Pecan), and Dessert Delights (Cherry Almond Crisp, Classic Lemon Bar, Cranberry-Orange Sorbet, Apple-Pecan Pie)...or all three boxes as a lovely Trio of Delights! Kosher. 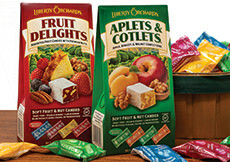 Aplets & Cotlets Minis: sugar, corn syrup, walnuts, modified corn starch, fruit juice from concentrate (apple, apricot), pectin (pectin, disodium diphosphate, sodium polyphosphate, dextrose, dicalcium phosphate), natural flavors, sodium citrate, citric acid, malic acid, soy lecithin. ALLERGEN INFORMATION: May contain traces of peanuts and tree nuts not listed in the ingredients. Contains nuts and soy. Fruit Delights Minis: sugar, corn syrup, nutmeats (walnuts, almonds, pecans, macadamias, cashews), modified corn starch, fruit [fruit juice from concentrate (strawberry, blueberry, raspberry), pineapple, raspberries], pectin (pectin, disodium diphosphate, sodium polyphosphate, dextrose, dicalcium phosphate), natural flavors, sodium citrate, citric acid, malic acid. ALLERGEN INFORMATION: Contains nuts. May contain traces of peanuts and tree nuts not listed in the ingredients. Our macadamia candies include a small amount of cashews. Dessert Delights Minis: sugar, corn syrup, nutmeats (almonds, pecans), modified corn starch, fruit [fruit juice from concentrate (apple, cranberry, cherry), cranberries, candied orange peel], pectin (pectin, disodium diphosphate, sodium polyphosphate, dextrose, dicalcium phosphate), natural flavors, sodium citrate, citric acid, malic acid, soy lecithin.